Two bingo nights have been arranged with the first one on Friday 30 November and the second one on Friday 14 December. Eyes down at 8pm for both. Invite friends and family for an enjoyable evening. These nights have been added to our events page, to visit the events page please click here. Two new bingo nights have been arranged for Friday 30 November and Friday 14 December. Eyes down at 8pm both nights. Invite family and friends for an enjoyable night. These social events have been added to our events page. The Royal British Legion recently launched an initiative entitled Sports Remembers. It has encouraged individual sports to identify and remember those who sacrificed their lives for King and Country in the battle of the Somme 100 years ago. The Professional Golfers Association (PGA) has wholeheartedly embraced this initiative and undertaken research to appropriately recognise all of its PGA members enlisted to fight throughout the Great War of 1914 – 1918 and who made the ultimate sacrifice for King and Country. The PGA has advised that Charles Fraser was the Golf Professional at Forres Golf Club prior to joining the Royal Scots Fusiliers. At the age of 30 he died of wounds on the 10th October 1917 and is commemorated at Etaples Military Cemetery, Boulogne, France. Charles Fraser was born in Nairn in 1886; he started his career as assistant to Joe Dalgleish at the local club and was then professional at Forres between 1907 and 1914. In October 1913 he was presented with a dining-room clock by the members of the Forres club on the occasion of his wedding and he played in the Scottish Professional Championship the following year. He then enlisted in the Royal Scots. It was announced in early October 1917 that he had been severely wounded and, the following week, he died of his wounds in hospital at Dannes-Camiers. 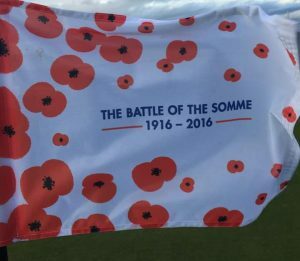 The Professional Golfers Association has presented Forres GC with a Poppy hole flag. This flag will be flown on the pin on the 18th hole. The PGA is grateful Forres members have joined other golf clubs in remembering the loss of their Golf Professionals who went to war and never returned. This is the first time in the history of the competition that Forres has triumphed. This prestigious trophy (played as an inter club foursomes event) was first played for at Balgownie in 1900. Teams from the counties of Aberdeen, Banff, Caithness, Inverness, Kincardine, Moray, Nairn, Orkney & Shetland, Ross & Cromarty and Sutherland are eligible to compete. In what was a tough draw, Forres triumphed against some clubs that had won the cup in recent times including the previous years winners Moray. Forres defeated Peterhead 1 at the 19th and in the next round defeated Nairn 2 up. They then defeated Cruden Bay 1 up before winning their semi-final 2 up against last years winners Moray 1. In the final Forres won 4 up against Moray 2. A copy of the draw/results is available here. Congratulations to Jeff Wright, Matty Wilson, Bryan Fotheringham and Robert McKerron for such a great achievement. Back at Forres Golf Club. Left to right: Matty Wilson, Bryan Fotheringham, Robert McKerron and Jeff Wright.